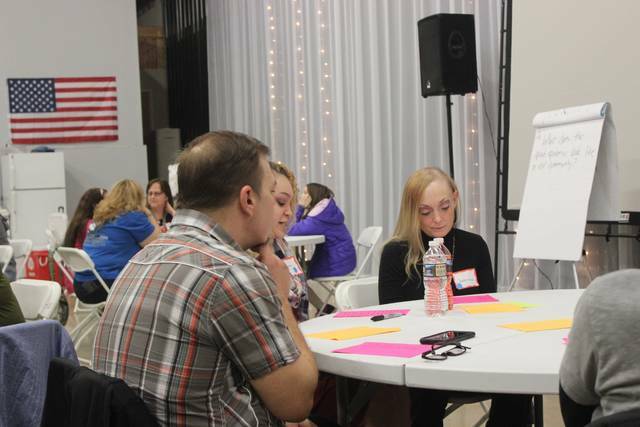 Carla Doctor (right) attended the Your Voice Ohio community forum on opioid addiction Feb. 19 and contributed her story and notes to the project. Doctor said she used heroin daily for 10 years and needed a prison conviction to initiate her recovery efforts. Doctor said she has been in successful recovery for one year and two months. Doctor’s mother, Cathy (left) attended the meeting in support of her daughter. 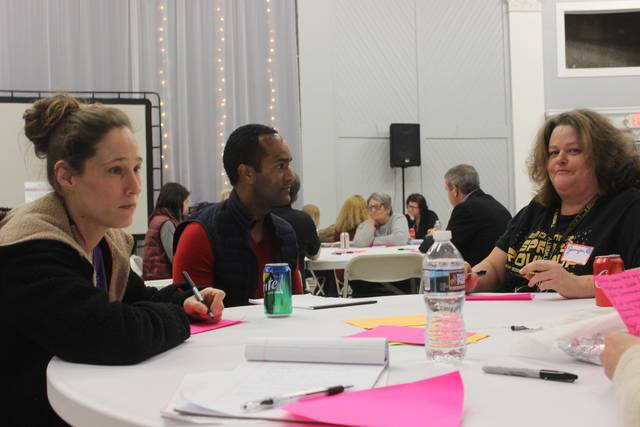 The two were featured this week on an ABC 6 television segment, ‘Fayette County community uniting to fight opioid epidemic,’ filmed by WSYX-Columbus and Eye on Ohio during the forum. 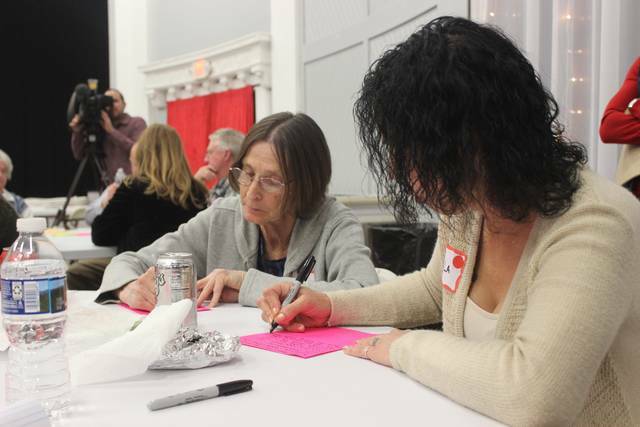 Anna Conger (left) appears deep in thought while writing notes during the forum on what the opioid epidemic looks like in Fayette County. Conger is a recovering pain pill user and said her pain pill addiction began 12 years ago.Conger had been 49 days into a successful recovery on the day of the forum. Conger said she woke up on New Year’s Day, 2018, and decided to put herself into rehab and completed a 20 day program at Woodhaven in Dayton. Atright, Conger’s friend Jennifer talks to ABC 6 anchor Rodney Dunigan. 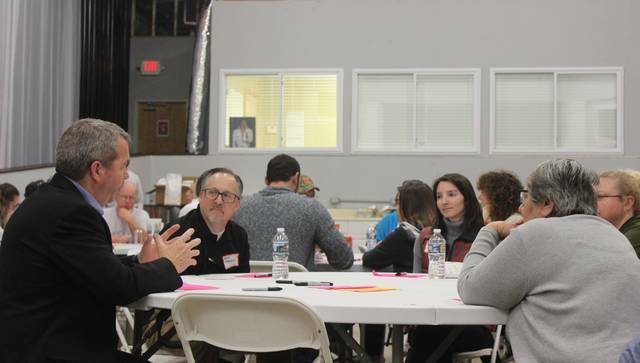 Fayette County residents discuss causes to the opioid epidemic with the editor of The Columbus Dispatch, Alan Miller (left). 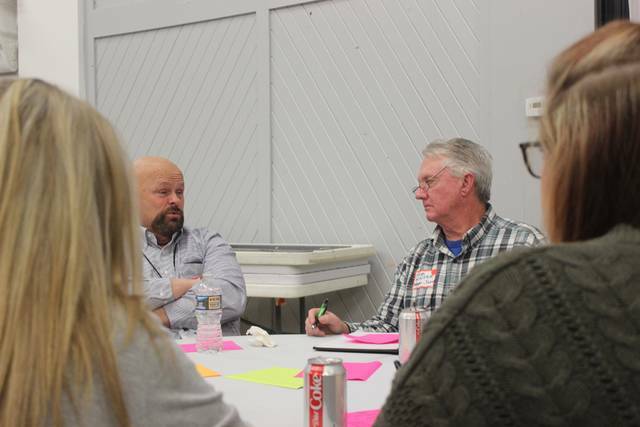 Pickaway Area Recovery Services Executive Director Barry Bennett (left) discusses the opioid crisis with Jeffersonville Mayor Bob Kinzer (right). 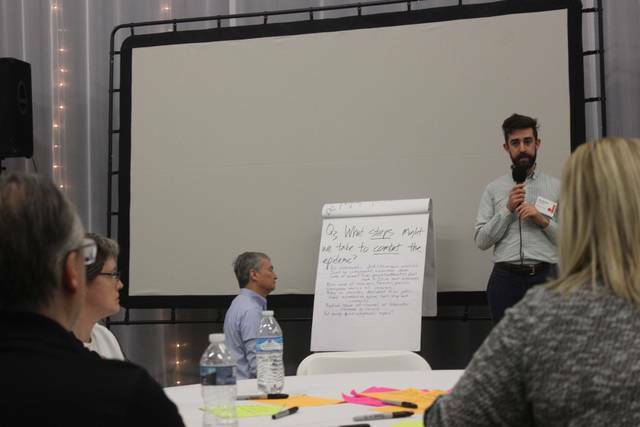 Your Voice Ohio Project Director Andrew Rockway (standing right) from the Jefferson Center in St. Paul, Minnesota, asks groups for their feedback as Your Voice Ohio Project Manager Doug Oplinger (kneeling left) writes participants’ responses on a large sticky note paper. 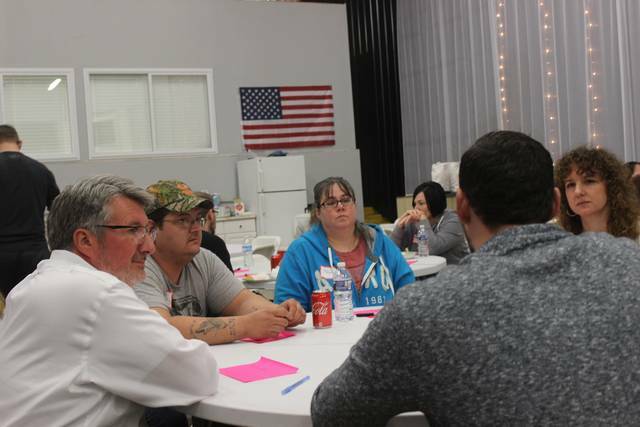 Fayette County Commissioner Tony Anderson (left) talks to the editor of the Chillicothe Gazette, Mike Throne (center) and several members of the community about the effects of the opioid crisis on the community. 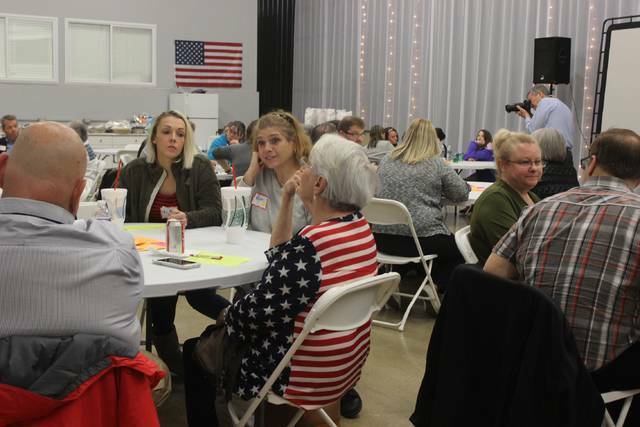 About 60 people attended the Your Voice Ohio forum Feb. 19 at the Langley building in Washington C.H. 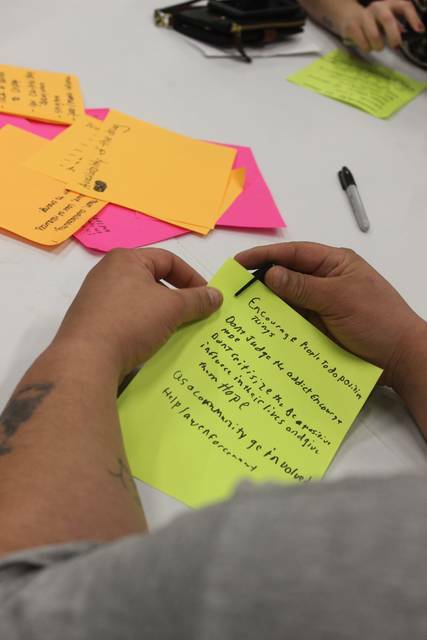 to address the opioid crisis in Fayette County, including recovering users, elected officials, nurses, treatment specialists, journalists, and community leaders.